There are two kinds of filtration for cat fountains; mechanical filtration which prevents cat hair and other debris from entering the pump, and chemical filtration which remove impurities from the water. Every fountain should have the first, not every fountain needs the second.Mechanical filtration, such as the food-safe foam, or sponge filter you see below, and which we have made, specifically and only for Thirstycats, absolutely eliminates any possibility of material such as cat hair or food from getting into the pump, as the thickest part of the filter covers the intake part of the pump. Not only does this keep the pump running smoothly, it also keeps the pump clean, eliminating the necessity of weekly pump cleaning and ensuring fresh, clean water. Every time you clean your cat fountain, give the filter a thorough rinsing (a spray nozzle is best), with hot water, then cold water. Once in a while you might put a little vinegar in a bowl of hot water and let it soak for a bit. Then rinse very thoroughly. You can even put it in the microwave for a minute on high for absolute certain elimination of unwanted elements. A healthy water source is one of the most important elements for keeping healthy, happy cats and nothing, bar nothing, serves better than a handmade, ceramic, food safe cat fountain with proper filtration. It is often said by vets that water is the single most important element in your cats’ diet, critical to the distribution of all other nutrients throughout the body and it is vital that that water be as clean as possible. These pet fountain pre-filters contribute greatly to this so long as you keep them clean, which is easy to do. Our foam pre-filters last about two years, unlike almost all other cat fountain pre-filters which last weeks. 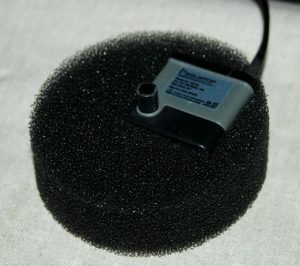 You can purchase extra of our foam filters here. In a cat water fountain it removes impurities which cause unpleasant tastes and odors. The carbon we use in our cat fountain carbon filters is high density, pelleted, activated carbon contained in a reusable nylon sac. It actively draws and absorbs impurities. We use 20 grams of carbon for each filter – about 66 times that used in commercial filters. This is why our cat fountain carbon filters last at least six months and as long as one year, whereas many commercial cat fountain makers require replacing the filter every 2 weeks or oftener. Because the water is constantly circulating in the fountain, all the water is continuously coming into contact with the filter and being cleansed. (The method used in aquariums with this same filtration media is to simply hang the filter over the rim of the aquarium and let it dangle in the water.) Many of our customers use bottled or filtered water in their cat fountains so don’t require a carbon filter. This is why we don’t include them with every fountain, which would also require raising the price of the cat fountains. Many of our customers have left reviews about the effectiveness of our carbon and foam filters and they are all exceedingly positive. They work, and they work well. You can purchase our carbon filters here.